To be held in India for the very first time, over 25,000 artists from 30 countries will participate in the Theatre Olympics. Touted as the largest international theatre festival, the eighth edition will be hosted by the National School of Drama (NSD). The 51-day theatre extravaganza will see 450 shows including 65 shows by international artists, 600 ambient performances and 250 youth forum shows across 17 cities. The festival will be inaugurated on February 17 at the Red Fort by Vice President M Venkaiah Naidu, and conclude in Mumbai on April 8. What to expect from the 8th Theatre Olympics? This is a great opportunity to watch some of the best plays from across the country and the world. Besides exceptional theatrical performances, there will be other activities like the Living Legends series, masterclasses and workshops. It will also include two international seminars and six national seminars. Eminent Indian theatre personalities like Shabana Azmi, Paresh Rawal, Manoj Joshi, Seema Biswas, Ratan Thiyam, Alyque Padamsee, M K Raina, Bansi Kaul and Usha Ganguly are expected to attend, among others. Conceptualized by Greek theatre director, Theodoros Terzopoulos in 1993, the idea was to gather together the best theatre practitioners from around the world and create a forum for exchange — of ideas, cultures, forms and practices. It was also to be another kind of exchange, between eras, trying to find a continuum between the past, present and future of theatre. 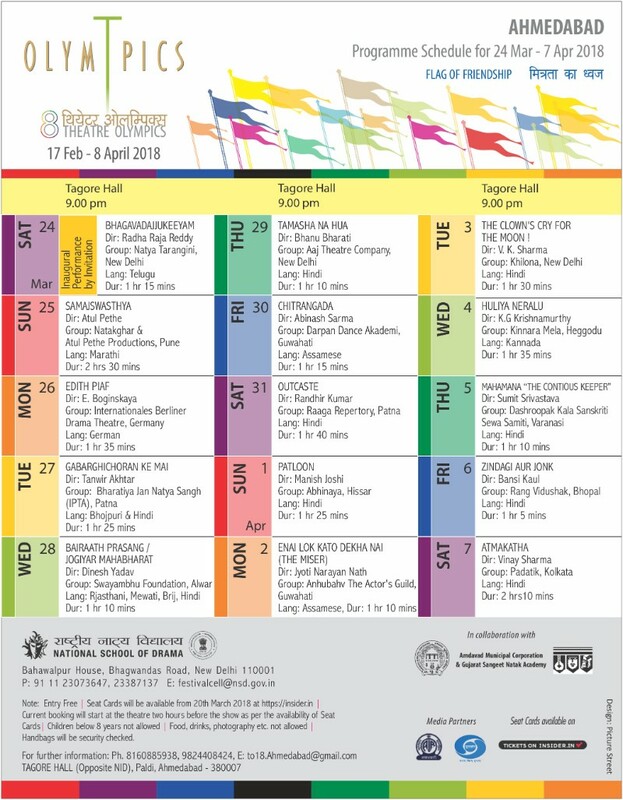 The biggest theatre events in Ahmedabad.